It is forgivable, all things considered, that Gareth Bale cold-shouldered the plaudits from team-mate Lucas Vazquez last weekend with a disdainful flick of the hand. For months now, Real Madrid's Welsh wonder has been a man traduced inside his own dressing-room. First, Marcelo derided Bale's insistence on conversing in English, even after six years of living in Spain. Then goalkeeper Thibaut Courtois let slip Bale's black-sheep status by describing him, acidly, as 'The Golfer'. It would require a hide thicker than an Iberian bull's not to show a flicker of resentment at being so publicly knifed. On the surface, the arguments of Bale's detractors are not without merit. Nobody expected the winger to reveal himself at Real as a natural polyglot, but his linguistic efforts have been, by any stretch, dismal. Equally, he does, as Courtois hints, display a consuming fascination with golf, even opening a course in his back garden with replicas of the 12th at Augusta and the 'Postage Stamp' eighth at Royal Troon. But this hardly seems a reasonable pretext for cutting him adrift. The sadness is that this should have been Bale's moment to conquer. The long shadow of Cristiano Ronaldo had shifted to Juventus, the image of his bicycle kick to sink Liverpool in the Champions League final remained vivid in the memory, and a young manager, in Julen Lopetegui, looked ready to grant him the love that Zinedine Zidane had withheld. Instead, he has slipped into the shadows once more, an impact substitute at best under Santiago Solari and an easy target for colleagues irked by his refusal to be one of the boys. And yet to view Bale purely in terms of his aversion to parties, or his struggles to switch from his native tongue, seems a churlish, reductive analysis. True, his career at the Bernabeu has been an all-too-spasmodic sequence of highlights, rather than the 50-goal-a-season masterwork furnished by Ronaldo. But what luminous highlights they are: the impossible run to skin Barcelona's Marc Bartra in the 2014 Copa del Rey, the extra-time goal to help seal La Decima against Atletico Madrid a month later, and the acrobatic finish that electrified last summer's showpiece in Kiev. These are flourishes unrivalled by any active British player and they ought to protect him against sullen muttering about his fondness for quiet nights in. The prevailing wisdom in Spain is that Bale is his own worst enemy with his peevish attitude. He hardly helped his cause by celebrating a goal at Atletico with a controversial "sleeve cut" move, folding one arm and striking it with his other hand. In his adopted land, this was widely interpreted as an offensive corte de mangas, akin to holding up a middle finger. Bale escaped any punishment yesterday, even though he could technically have received a 12-match ban. Still, among his critics, an image as a truculent provocateur has stuck. Bale's struggles to cement a starting place with Solari might make a degree of sense if Real were streaking away at the summit of La Liga. But this is a team who look leaden, rudderless, one who in November lost 3-0 to Eibar. It is as if the recent glut of Champions League success, with three successive triumphs, has quenched any thirst for a repeat. How else to explain why Bale, a central figure in Real's dominant European era, has been rendered superfluous? The impression is that he has become, at 29, a dispensable luxury item, one with which the club no longer have any idea what to do. His body language screams of a man writing his Spanish endgame. Blanking team-mates, as Bale did with Vazquez after scoring a penalty against Levante, suggests an unhappiness beyond repair. The portents are far from encouraging. As it stands, Bale is being kept out of the team by Vinicius Junior, an 18-year-old who has yet to make his debut for the Brazil national team. The teenager has managed just four goals in Real colours, against Bale's 101. 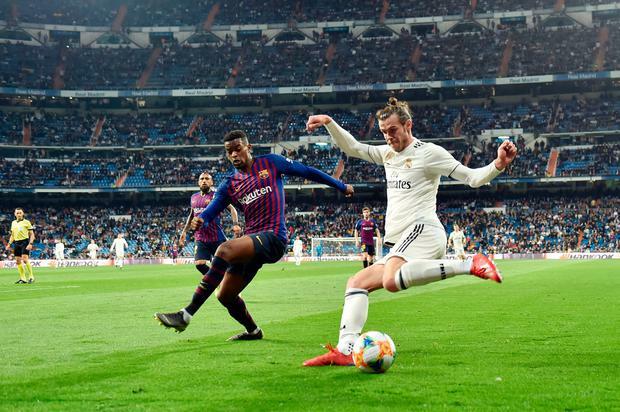 But the more salient distinction is that Vinicius plays with dynamism and a palpable enthusiasm, whereas Bale wears the air of one who would prefer to be testing out the latest three-iron. As such, the established star finds himself cast, apparently irrevocably, as a malcontent. It is a regrettable turn of events. At his most fulfilled, Bale is a warm, personable character, and an exhilarating footballer. But the capricious system of patronage at the Bernabeu, long a Bermuda Triangle for managers, has beaten him. A catalogue of painful snubs - from Zidane, who never fully trusted him, to Solari, who has demoted him behind a youth-team player - has worn him down. Surely, such an outstanding talent, and one with the priceless added gift of scoring when it matters, deserves better.